Life is so predictable for Manchester United fans these days. No drama, no excitement, no thrill and no goals. And this cycle continues for the entire 90 minutes. In almost painstaking slow motion. Same story week after week. And looking at all this, 75,000 fans at Old Trafford and millions across the world scratch their heads in frustration and ask a question to themselves in total disbelief. Manchester United: Why so boring? In the current scenario, it is hard to understand why is it so. With Anthony Martial, Memphis Depay and Lingard in their ranks, United do have genuine pace. To complement their pace and to put it to good effect, they have world class distributors of the ball in Wayne Rooney, Bastian Schweinsteiger, Michael Carrick, Ander Herrera and Juan Mata. But still they have only scored 1.5 goals per game in the current campaign, the lowest amongst the current top eight in the Premier League. Manchester United has been more of a We-shall-not-lose rather than a We-should-win team this season. 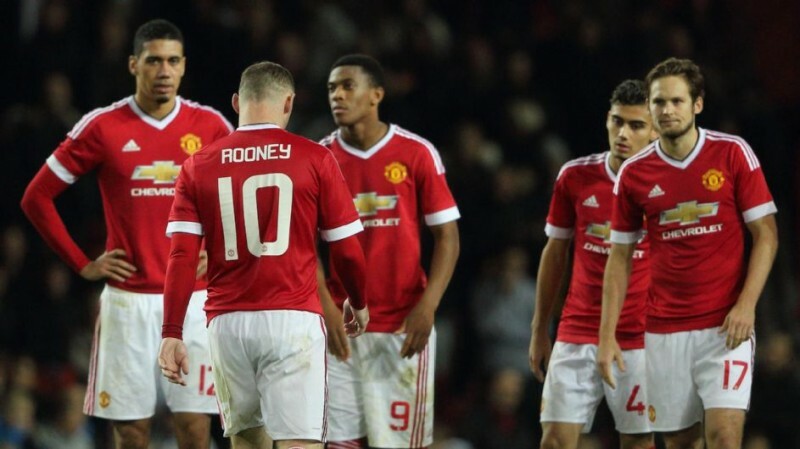 That’s what Louis van Gaal and his ‘philosophy’ seems to be demanding from his players – do not lose. And although United supporters are satisfied with their strong defensive displays this season that currently sees them into the second place in the league table, it is their overall build up play, tedious passing and lack of goals that has left them exasperated. After all United have traditionally been a highly entertaining team and, therefore, every fan who dedicates their precious couple of hours in watching United play can least expect an edge-of-the-seat high tempo passing resulting into multiple goal scoring opportunities rather than their team drawing out a mundane blank. Style of play can never be compromised at Manchester United – not even at the cost of results - and the fans’ patience seems to be dying out right now as can be seen from last night’s performance against PSV Eindhoven where the team was jeered off the pitch at the final whistle. Why does United always play with two holding midfielders? United need to start taking risks. With the entire focus on not losing the game, they are currently being set up so defensively and compact so as not to concede a goal. Why is there a need for playing two holding midfielders? Especially at Old Trafford and that too against weaker oppositions. United have started all their matches this season in a 4-2-3-1 formation with two out of the three (Carrick, Schweinsteiger and Schneiderlin) as holding midfielders playing in front of the back four. It is understandable of having this set up in playing tough away matches in Europe or Premier League, but having the similar set up at home matches doesn’t really make any sense. Instead of using two holding midfielders, United can use only one and replace the other with a more creative midfield player – like Ander Herrera or Juan Mata – and play more of a 4-1-4-1 formation. This will not only add the much-needed spark in midfield but also add more of a goal scoring threat where the attacking midfielder makes the late runs into the box which neither of the two current holding midfielders are capable of doing. If United had employed this against PSV Eindhoven, they would have already been into the knockout rounds by now. Instead, they are now facing a tough challenge away to Wolfsburg on the final matchday. 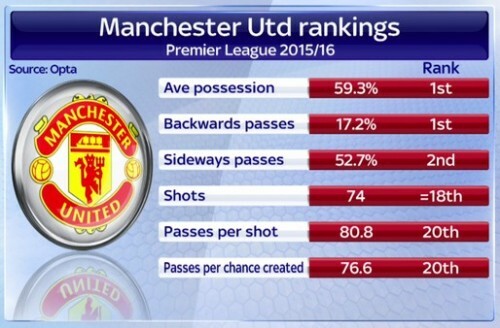 And what has been worse is that this tactic has not even been considered in Van Gaal’s plan B. Whenever the Dutchman is looking out for a change, he brings on Marouane Fellaini and encourages the team to play direct football which is certainly not a way a team of United’s calibre should be playing anytime, let alone almost every week. This only demonstrates the desperation amongst the United ranks. Time to sacrifice a holding midfielder for Ander Herrera? Michael Carrick has been the most consistent United player over the last five years and yet he finds himself third in the list of three holding midfielders players that Van Gaal has at his disposal. If United need to play attacking football and thread forward passes from midfield, Carrick, when fit, needs to start every match. 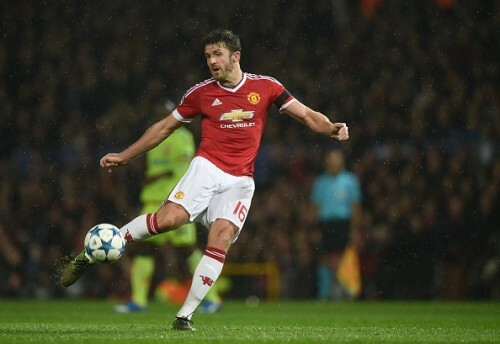 The reason is quite simple – Carrick, in his 10 appearances, has completed 489 passes this season with a pass accuracy of 90%, of which 84% were forward passes. Let’s compare this with the other two holding midfielders. 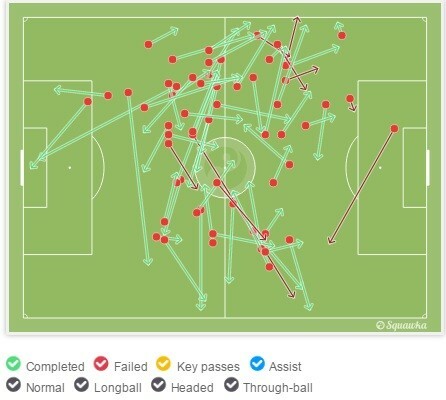 Bastian Schweinsteiger, in his 13 appearances, has completed 292 passes this season with a pass accuracy of 86%, of which 82% were forward passes. And Morgan Schneiderlin, in his 11 appearances, has completed 231 passes this season with a pass accuracy of 87%, of which 76% were forward passes. The Englishman has a clear edge in forward attacking play over the German and the Frenchman. 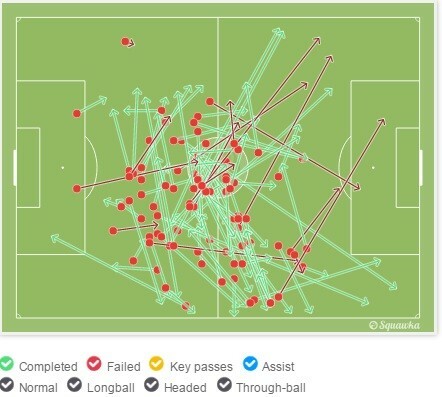 He has completed almost twice as many passes and most of them have been forward passes. 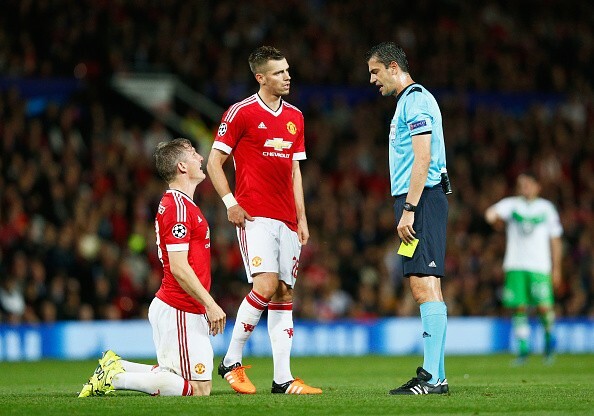 Do Manchester United really need both Bastian Schweinsteiger and Morgan Schneiderlin together on the pitch at home? Schneiderlin and Schweinsteiger, on the other hand, play way too many sideways or backward passes that make the play very slow and predictable. This is also reflected in the statistics above where United are currently first and second in the number of back and side passes respectively. Both, the German and the Frenchman don’t seem to take any risk, get stuck to their own half and just concentrate on keeping the ball. Have a look at their passing in the last match against Eindhoven. Most of them have been sideways in their own half, and even if they had tried passing the ball forward, it didn’t come through. 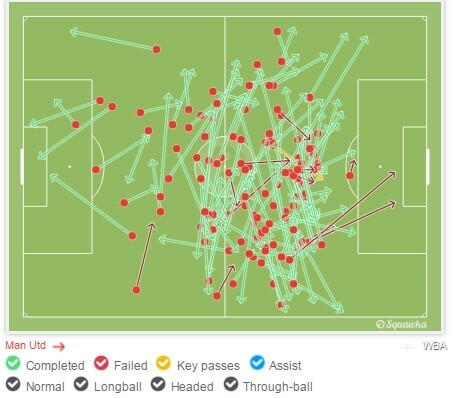 Compare the above to Carrick’s most recent performance against West Brom and you can clearly see the difference in the number of passes that he completed in the opposition half and that too a majority of forward passes. The above depicts an array of passing repertoire and the vision to execute them that only the Englishman possesses from a deep-lying playmaker's role. He is certainly the best in that position at United, if not in the entire league. And hence United needs to use him more often than not. Manchester United certainly have the required ingredients to start playing their natural free-flowing game. What is required is a change of mindset and a risk-taking appetite on the part of Louis van Gaal. The Dutchman needs to understand that the United supporters are looking for exhilarating performances and the results will automatically follow. Right now, the good results have slightly slackened the criticism that is coming his way, but with performances such as the one against Eindhoven, it is only a matter of time he starts to feel the real heat of it. Let’s hope the United boss realize this sooner rather than later and, with Christmas just around the corner, presents the United fans the performances that they have long been craving for.